The Account Receivables accountant of your company want to be able to display the so-called top and flop customers in regards to their payment ability based on the gross amount of the open invoices. The company accountant should be able to select how many customers have to be displayed per category and due to the regular update of the business data, the categorization have to be executed on-the-fly. Millions of open item invoices are typically processed in such tasks. More information about the Open Items Analysis reference scenario underlying this use case is available under http://scn.sap.com/docs/DOC-41248. In this step, you will create a regular global class and then mark it as AMDP class by specifying the tag interface for the SAP HANA database platform. 1. Start the ABAP Development Tools (aka ABAP in Eclipse) - or your SAP HANA Studio - and open the ABAP perspective by selecting menu entry Window > Open perspective > Others…, and choosing the ABAP entry in the appearing dialog box. 3. Maintain the required information (e.g. 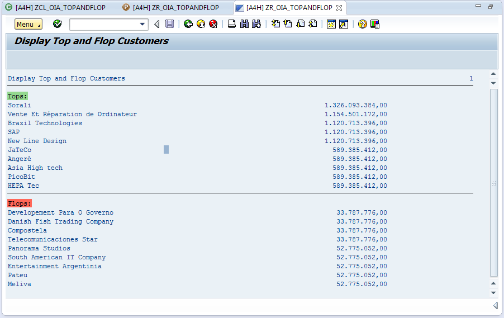 ZCL_OIA_TOPANDFLOP as name and “EPM OIA: Best and Worst Customers” as description) and click on Next. Select a transport request if required and confirm the creation dialog. You've just created your first AMDP class! You will now declare the method get_top_and_flop which will be implemented as AMDP method later on. This method has an importing parameter for specifying the number of customers to be retrieved for each category (top and flop), and two exporting parameters getting for the two requested result sets. Info: An AMDP class can contain both regular ABAP methods and AMDP methods. An AMDP is declared like a regular static method or instance method in any visibility section. An AMDP method cannot be identified as such in the declaration part of the class. Nevertheless, the parameter interface of an AMDP method has to fulfill specific prerequisites. For example the parameters must be declared using VALUE for pass by value and return values cannot be declared using RETURNING. Before going ahead with the method definition, we first have to defined the type of the result sets. 1. Define the two types ty_bupa_selection and tt_bupa_selection in the PUBLIC SECTION of the class definition - With ty_bupa_selection defining the table line of our return set, and tt_bupa_selection defining the type of the returned tables. tt_bupa_selection TYPE STANDARD TABLE OF ty_bupa_selection WITH EMPTY KEY. 2. Now define the public static method get_top_and_flop. Info: Analog to native SQL with ADBC and EXEC, the AMDP framework does not support automatic client handling. It means that in case of client-specific computations, the client context has to be passed to the AMDP method and used appropriately in the SQLScript coding. 3. 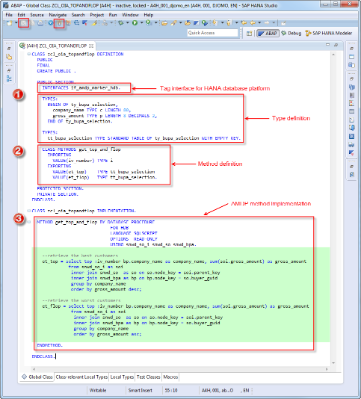 An error will be displayed in the editor due to the missing method implementation. Just use the Quick Fix (Ctrl+1) function “Add implementation for get_top_and_flop” to quickly solved this issue. 4. Save your AMDP class. You will now implement a relatively simple SQLScript-based AMDP method, which retrieves the best and worst customers depending on the gross amount of open invoices. Info: Whether a method is implemented as ABAP or as AMDP method is not decided in the class definition, but rather in the class implementation. An AMDP method is indicated as an AMDP method in the implementation part of the class using the addition BY DATABASE PROCEDURE of the statement METHOD. At the same time, the database platform where the method is used and the programming language used to implement the method are respectively specified with the additions FOR and LANGUAGE. Further additions are available. 1. Mark the method implementation as an AMDP method. 2. The compiler now knows, that the implementation of the method get_top_and_flop of the class ZCL_OIA_TOPANDFLOP is an SQLScript-based AMDP for the HANA database platform.The addition USING contains the name of the DDIC tables which will be used in the implementation. Note: The purpose of this tutorial is not to introduce the SQLScript programming language or to demonstrate how complex the logic of a database procedure can be. The above procedure implements a relatively simple data-intensive function, but of course very complex logic (making even use of the advanced HANA features and functions such as data mining and predictive analysis) can be implemented. As already stated, in case of client-specific computation, the client context has to be passed to the AMDP method and used appropriately in the SQLScript coding. Info: In order to quickly visualize whether a class contains AMDP methods and where, it is recommended to set a different background color for embedded languages – such as native SQL and SQLScript. To achieve this, go to the ADT menu entry Windows > Preferences and select the path General > Appearance > Color and Fonts > ABAP > Syntax Coloring > Embedded Languages (background color) and set the background color of your choice. 3. Save and activate your AMDP class. You're now ready to test your AMDP method! We will now create and implement a simple ABAP report which call the AMDP method and display the result sets on the screen. Info: An AMDP method is called like any other method in ABAP Objects. This requires, however, that the central database of the current AS ABAP is managed by the database system for which the AMDP method is implemented - meaning SAP HANA in our case. If not, a runtime error is produced. Detailed analysis of such error can be done using the tools of the ABAP Dump Analysis (ST22). 1. 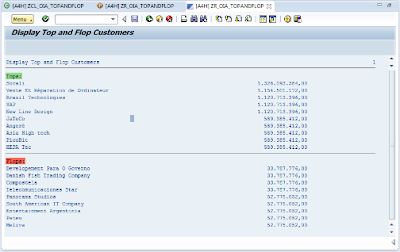 Create the ABAP program ZR_OIA_TOPANDFLOP. Select the package of your choice, right-click on it and choose context menu entry New > ABAP Program. Enter the required information (name, a description - e.g. “Retrieve and Display Sales Order with Open Days and BuPa Data”-) and press Next. Select a transport request if required and press Finish to confirm the creation dialog. 2. Now implement the report. For this purpose, just copy & paste the source code below into the ABAP editor. PARAMETER pnumber TYPE i DEFAULT 10. WRITE: / 'Best customers:' COLOR COL_POSITIVE. LOOP AT lt_top ASSIGNING FIELD-SYMBOL(<f>). WRITE: ' Worst customers:' COLOR COL_NEGATIVE. LOOP AT lt_flop ASSIGNING FIELD-SYMBOL(<g>). WRITE:/ <g>-company_name , <g>-gross_amount . 3. Save and activate your test report. 4. You can now run the report (press F8) and see the result of your effort. Congratulations! You have just experienced how easy it is to implement an SQLScript-based AMDP and consume it in ABAP. Regarding the transport aspect, AMDP classes are transported similarly to regular ABAP classes using the standard ABAP transport mechanism. No HANA artifacts have to be transported. This means that the HANA transport container and the HANA delivery units are not involved in this process. You can have a look at video tutorials demonstrating how to create an AMDP and how to debug an AMDP here.